As the Labour Party goes into its third annual conference with Jeremy Corbyn as leader, are his anti-austerity policies closer to being realised? Is the party being transformed in a socialist direction? The conference comes just after a new survey conducted by the Independent again showed: "The British public has given overwhelming backing to major parts of Jeremy Corbyn's policy agenda." So it's not surprising that the latest YouGov poll on voting intentions still indicated that Labour would win a general election held today. This stems from millions of people being desperate to see Corbyn's polices implemented - an end to neoliberalism and austerity which have meant wage restraint, student debt, lack of affordable housing, zero-hour contracts, profiteering rail, water and energy companies, and much more. 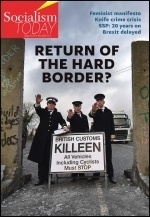 Labour's general election manifesto, engineered directly by Jeremy Corbyn and John McDonnell, was a hugely welcome departure from the Tory-lite ones that came before it. Also a major step forward has been the willingness of those two top Labour leaders to stand on picket lines alongside workers fighting cuts in jobs, pay and conditions. 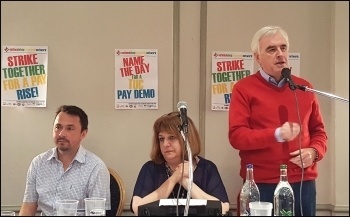 John McDonnell's well received message to strikers assembled at the pre-TUC rally of the National Shops Stewards Network (NSSN) was: "We'll be in parliament supporting you, but we'll be on the picket lines supporting you too." This pledge, along with the expressed readiness of a number of left trade union leaders to lead industrial action against low pay, gives extra confidence to workers who are entering into struggles. However, it is also still the case that genuine supporters of Corbyn and McDonnell are in a small minority among Labour's MPs in parliament, councillors in local authorities, and in its party officialdom. Among the party's rank-and-file members though - with membership having doubled since 2015 - it is a very different picture. There, Corbyn supporters are a majority, as his leadership victories twice proved. So the party is still very much 'two parties in one': those who back the Corbyn and McDonnell leadership and those who badly want rid of them. Conference delegates from Constituency Labour Parties (CLPs), who have half the conference votes when card votes are called, are expected to number 1,155. Corbyn-supporting group Momentum reports from its survey of their opinions that 844 of them want to see the reforms it supports. This reflects the fact that newer members and re-joiners have come to the fore in many CLPs across the country, though there have also been reports of areas in which the more established right-wing layer has mobilised and retained its positions. However, the more numerous Corbyn-supporting delegates will have very little opportunity to influence party policy and rules at this conference, following the years of Blairite changes that drastically reduced the role of the conference as a decision-making body of the party. Jeremy Corbyn has rightly insisted on limiting the number of conference platform speeches by Blairites in order to give more time to delegates. The left has also applauded the recent election of two Corbyn supporters - Billy Hayes and Seema Chandwani - to the conference arrangements committee. But their role doesn't apply to this year's conference, it only begins once it's over. At the time of writing this editorial, it was not yet known what Labour's national executive committee (NEC) - meeting on 19 September - will decide on shaping the conference agenda. It will agree its proposals for the conference, including on the 'McDonnell amendment', a widely discussed constitutional change to lower the number of MPs and MEPs required to nominate a candidate for party leader, to make it easier for a left candidate to stand. But there have been no reports or expectations of proposals from the NEC for any substantial changes or reversals to be made to the large body of rules created by the right wing to serve their driving of the party in a pro-capitalist direction. Also, many motions from CLPs can simply be dismissed from being put to the conference. In an interview in Red Pepper, Seema Chandwani touched on how undemocratic the conference is: "Faith needs to be restored back into our conference. Last year we saw very distinct rule changes bunched together in one vote, rule changes that included local government budgets (cuts) and whether a sitting leader requires MPs' nominations to be on the ballot if challenged. These are not linked in any way, yet delegates had one vote to vote in favour or against all these changes, not individual votes on each item. How can we honestly trust a process that decides rules in this way?" The sneaked-in rule she refers to on local government budgets banned Labour councillors from voting against cuts budgets agreed by their council Labour group. Since that 2016 conference, anger in local communities and council workforces at savage cuts being imposed by Labour councils has only risen further. There are many examples, including Haringey Labour council's plan for massive privatisation of public assets, involving selling off council homes, land and buildings. But most prominent at present is the sustained attack underway on the jobs and service delivery of Birmingham bin workers by their Labour council. In both Haringey and Birmingham the outrageous actions of the councillors are too much even for the Labour MPs in those areas, who have called on the councillors to change direction. 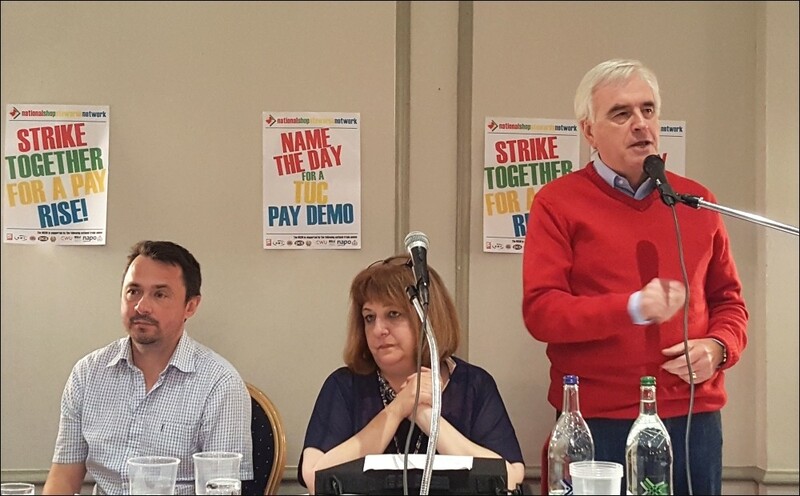 At the packed-out NSSN rally, John McDonnell argued that the Birmingham bin workers are fighting "against austerity, not Labour". But how can workers separate the austerity from Labour when they are facing unnecessary and devastating job and wage cuts at the hands of Labour locally, right now? And neither are the two separated in people's minds across local communities, as was partly shown by the local election results in May. Labour lost over 300 seats and only received 27% of the overall vote, compared with an achievement of 40% of the vote just a month later in the general election after Labour's anti-austerity manifesto was released. The council cuts don't have to be made. 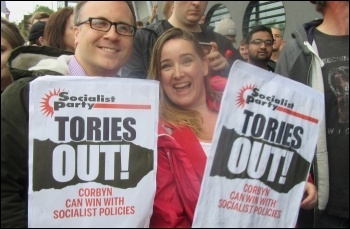 The Socialist Party, with its allies in the Trade Unionist and Socialist Coalition (TUSC), has time and time again put forward a viable alternative, calling on councils to buy time to build a campaign against Tory cuts by using their reserves and ample borrowing powers (see, for example, the TUSC document 'Preparing a no-cuts people's budget'). To build real confidence in its anti-austerity leadership, Labour needs to start showing that whenever it is in power - whether locally or nationally - it will completely reject any implementation of austerity. Unfortunately, Jeremy Corbyn and John McDonnell have so far only rejected imposing it when they are elected to power nationally. As well as more vital jobs and services being lost in the meantime, the danger is that after constantly blaming 'Tory austerity' at local level, when at national level they come up against the 'diktats' of capitalist economic crisis and the determined resistance of big business interests, it could be those factors and forces that are blamed next, to justify limiting pro-working class measures. Columnist Yasmin Alibhai-Brown, writing in the 'i' paper, reminded readers that "austerity was never about... good housekeeping": "Britain's GDP has doubled since 1978, but only the top 10% of the population has seen its wealth double. Money has grown on abundant trees for that segment; the bottom 10% have been pushed down and vanquished... millionaires and billionaires get more... while the rest are expected to give up more." The battle in the Labour Party needs to come down to taking clear class sides: either promoting the interests of the working class and the majority in society, or being exposed for succumbing to big business and capitalist interests. Corbyn supporters need to organise more extensively and efficiently than the right wing, adopting a pro-working class, socialist approach and ideology, to maintain and build on the attraction of Corbyn's ideas. This should include working with other left and anti-cuts activists who share similar goals, and firmly rejecting the thousands of spurious exclusions from Labour Party membership that have been carried out. 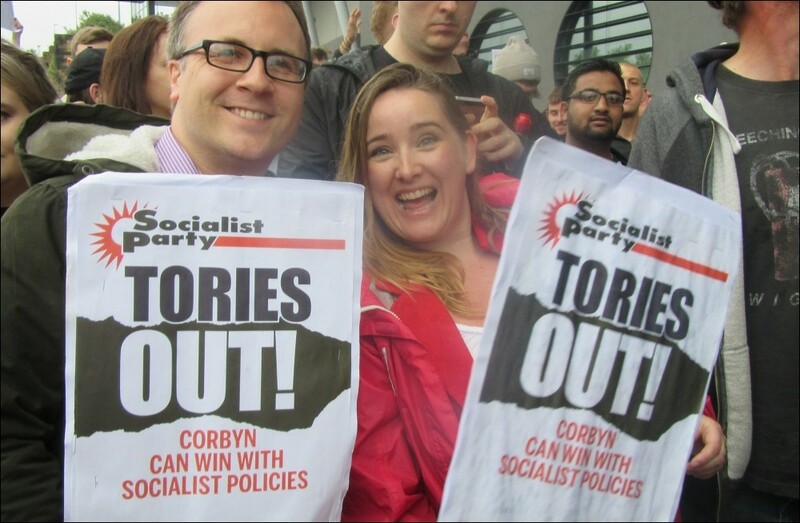 Some Socialist Party members and others have been denied Labour membership for having stood in elections against right-wing, cuts-inflicting Labour candidates. But taking such a stand should have been seen as a badge of honour in the labour and trade union movement, as working class communities certainly have seen it, and not a reason for division between those genuinely fighting austerity. Labour Party branches and conferences need to be developed as hives of discussion on how to develop this unity, as well as on all the crucial political issues that need to be debated, including the urgent question of how a pro-working class Brexit can be achieved. In tandem with the development of grassroots discussion and organisation, Corbyn and McDonnell and those around them at the top of Labour have the political authority to be able to push ahead with a bold programme of party democratisation - taking it directly to the membership in a referendum if necessary. This would need to include giving trade unionists a greater role, on a democratic basis, in the party decision-making processes; and placing the selection of election candidates in the hands of the membership through reinstating mandatory reselection contests. The huge surge of support for Corbyn, especially from the young, has given more than a glimpse of how popular a Labour Party would be that shows itself capable of really ending all austerity and going on to offer other improvements in people's lives. However, this much-desired outcome will only be achieved through a determined strategy of defeating the Blairite right and democratising the party from top to bottom, laying the basis for meetings that would be attractive and worthwhile for new participants, and for active engagement in workers' struggles. Mandatory reselection of election candidates to allow Labour Party members a democratic say in who their elected representatives are - kick out the Blairites! No more cuts budgets from Labour councils. Let the Tories dare to take on councils protecting our local services! 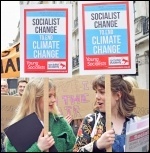 Why do young people need socialism? Strike to save our NHS! Deal concludes Barts health strike - "We have raised our heads high"